"A mainstay of the industry and a favorite among tank enthusiasts." "Kessil Logic lets users select the perfect spectrum and color with a single knob." "Designed specifically for growing saltwater coral." "Has 7,000K daylight LEDs to help your freshwater plants thrive." "Allows you to time the light’s dimness and intensity." 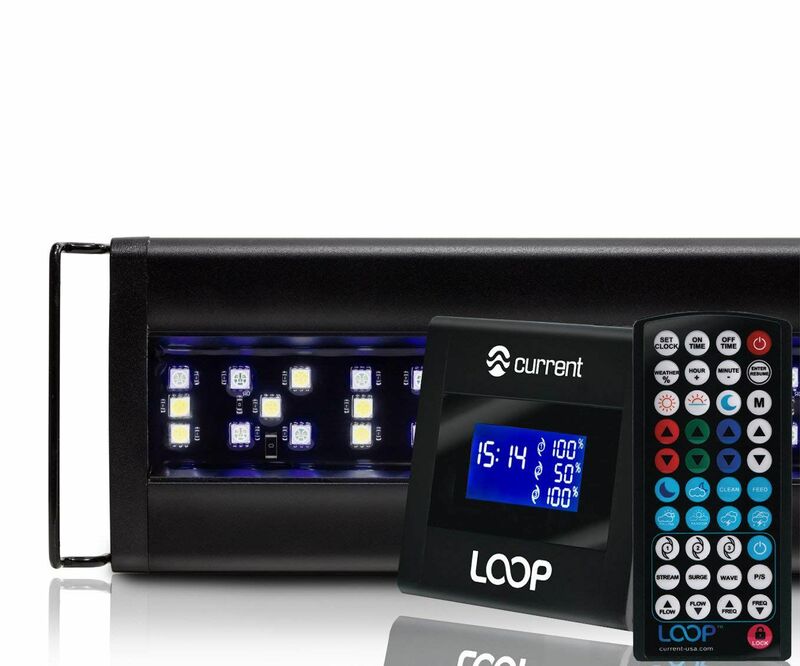 "This system features bright and long-lasting LEDs that don’t sacrifice power." "A low-profile lighting unit that won’t take attention away from your tank." The best LED lighting has spectrum stability, so it won’t change color or lose power over time. The Current USA Orbit Marine Aquarium LED Light is a mainstay of the industry and a favorite among tank enthusiasts thanks to its high level of durability. It’ll stimulate coral growth and make your tank look great while doing so, with a 24-hour light cycle that mimics sunrise through sunset and makes your tanks inhabitants shimmer with life. Designed specifically for saltwater aquariums, the Current USA Orbit LED Light is available in sizes that fit tanks ranging from 18 to 60 inches in length. In every case, it uses wide-angle dispersion lenses to ensure light spreads evenly over the whole aquarium. Online shoppers write that this lighting rig stimulates the growth of coral without fail, adding that the gradual sunrise effect prevents their fish from experiencing light shock. And because this model uses dual wavelengths, their coral’s colors are just as spectacular as the growth rates they’ve achieved. If you’re in the market for a high-end LED that brings professional-grade technology to your home aquarium, Kessil’s A360WE is more than worth the price tag. This LED light uses a proprietary technology called Kessil Logic that lets users select the perfect spectrum and color with a single knob, and then adjust the intensity—boosting light output at both ends of the spectral range by up to 30%. It also relies on patented, tightly packed LEDs that provide uniform color throughout the tank by marrying different wavelengths before they leave the light. This eliminates the “spotlight effect” you’ll see with some LED fixtures, and instead produces a natural-looking glow that more closely resembles the ocean. Customers say the Kessil A360WE is one of the best LEDs they’ve ever seen, writing that they’re small and compact but allow for far more tuning of intensity and color than competing models. There’s also a high degree of consistency, with the LED lighting the tank from top to bottom and left to right without dark spots at the edges or center. If you’re looking for an LED light that’s designed specifically for growing saltwater coral, MicMol’s is one of the best you can buy. It uses a smart controller to let you quickly select the ideal lighting for your tank, mimicking sunrise, sunset, and even lightning storms. It can be set to an automatic cycle that gradually moves between six stages, or manually programmed to meet your coral’s needs as it grows. With a thin unibody design, it can be mounted over tanks ranging from 13 to 66 inches in length. Customers write that MicMol’s Smart LED offers great bang for your buck, with easy assembly and plenty of opportunity for customization. Nothing is locked—owners have the ability to adjust each spectrum of light (white, blue, and red). And while the frame is sleeker than other designs, it doesn’t sacrifice power and offers all the brightness you’d want from a quality LED. Most customers note that they’ve seen improved coral growth after making the jump to MicMol. If you want the verdant look of a reef tank without the fuss of handling saltwater coral, you can still grow plenty of beautiful plant life in a freshwater tank. The Finnex Planted+ LED system is ideal for planted tanks, with an automated 24/7 light cycle transitioning from morning to night and back again. Users can also save up to four custom color and intensity combinations, using dimmable red, green, and blue LEDs along with 7,000K daylight LEDs to help your freshwater plants thrive. A remote control makes the lighting easy to operate and change on command, and the system itself can be purchased in sizes ranging from 20 to 48 inches. Customers rave about this fixture’s thin, modern design and strong output. For the price, several shoppers consider Finnex one of the best brands on the market, with quality parts and a high PAR rating, which measures the light available for photosynthesis. The Finnex Planted+ is no exception. By using an aquarium light with an internal timer, you can adjust the cycle of light inside your tank to suit your unique coral collection’s specific needs for growth. The VIPARSPECTRA Timer Control Series LED offers just that, with a timer that lets you separately control both blue and white channels to achieve the perfect balance. The unit is scientifically engineered to maintain the optimal balance of PAR output and coverage and can be easily adjusted to the appropriate height as it hangs above your tank. While it can’t be programmed to mimic the day-to-night cycle like some other units, the ability to specifically time the light’s dimness and intensity makes it a great pick for owners of photosynthetic coral. Customers write that setting each timer is a straightforward process, using a single remote to program both lights. The build quality is also high, and buyers say the lighting covers their whole tank well and has helped their coral flourish. Depending on the size of your setup, the VIPARSPECTRA can be purchased in either a 165W or 300W model, both of which include the timer feature. Want to invest in a great LED light for your tank, but concerned about the overall energy drain (or the bump to your electric bill)? Try an energy-efficient unit like this one from NICREW. Available in models suited to tanks from 12 to 52 inches in length, this system features bright and long-lasting LEDs that don’t sacrifice power (or shimmer) for energy efficiency. It features two modes: a combination of white and blue LEDs to simulate daylight, and blues alone for the night, and is built on a bracket system that extends to fit your tank. While it can’t be programmed to follow a customized cycle, switching between modes is as easy as flicking a switch. However, a single-channel timer can be purchased separately. Customers write that the quality of light from the NICREW is fantastic, especially for the price—it’s considerably less expensive than many other units. The nighttime blue light makes coral look especially spectacular and it reliably stimulates growth—although plenty of buyers also use it with freshwater plants and have noted similar success. Long-time aquarium owners are probably aware of the prevalence of dated, bulky lighting systems on the market. But sleek, modern products like Aquatic Life’s LED light fixture prove there are some great options out there for aquarists who want to keep the focus on their coral, not their hardware. This low-profile fixture measures only 0.5 inches high and four inches wide, but it still has plenty of power behind it. The Aquatic Life’s LEDs focus output inside your tank, with a timer that allows you to separately control white, mixed color, and moonlight LEDs. The fixture’s three channels also incorporate up to six colors for a complete lighting spectrum to keep your coral thriving. Buyers say the Aquatic Life LED fixture’s compact design sets it apart from the competition, but its robust output and programmable features make it a truly great investment. If you’re looking for a low-profile lighting unit that won’t take attention away from your tank, this is the one. Our writers spent 18 hours researching the most popular LED lights for reef tanks on the market. Before making their final recommendations, they considered 40 different lights overall, screened options from 40 different brands and manufacturers and read over 100 user reviews (both positive and negative). All of this research adds up to recommendations you can trust.